How to distinguish a real diamond from a fake? How to Identify a Real Diamond from a Fake ? 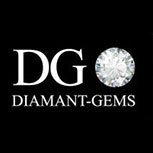 Accueil > Our Diamonds > Our Services > How to Identify a Real Diamond from a Fake ? Here is a very simple test to determine whether the stone in question is a diamond or a cubic zirconia. First, take a sheet of paper and mark a spot on it with a pen. Then place the stone on the paper. Position the table of the diamond facing downwards, centred on the spot. In the cubic zirconia, when you centre the stone on the spot the circular reflection of the spot will appear easily through the pavilion whereas, in a diamond, the reflection is dislocated to the point that it is almost undetectable. The stone on the left is a cubic zirconia, while the stone on the right is a diamond. With precision scales, you can distinguish a diamond from a cubic zirconia. A cubic zirconia weighs 1.7 times more than a diamond of the same diameter. A one carat diamond weighs 0.20 grams and has a diameter of 6.4 mm. Meanwhile, a 6.4 mm diameter cubic zirconia weighs 1.70 ct. Unlike cubic zirconia, diamonds are particularly hard and unalterable over time. By using a magnifying glass, it is possible to have a good overview of the facets of a diamond and the surface of the stone. You will never see lots of scratches and scrapes on a diamond and the edges between facets will be very sharp and pointed. 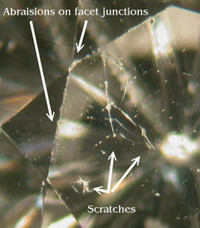 It is easier to see scratches in a cubic zirconia and the edges of the facets are always more rounded than those of a diamond. We are at your service to analyse your gems, contact us.